On March 10, Dell and Forum for the Future, sponsored a hackathon as part of New York City’s Open Data Week. The Open Data L-train Innovation Challenge asked participants to create ideas that focused on using open data to help mitigate and manage the effects of the planned shutdown of the Canarsie Tunnel in April 2019. This will be a major disruption to NYC’s transit systems: more than 225,000 commuters use the L-train and the Canarsie Tunnel to travel from Manhattan to Brooklyn every day. In 2012, Superstorm Sandy inundated that tunnel with more than seven million gallons of salt water. This led to significant corrosion of cabling, power infrastructure and track equipment. Post-Sandy, the tunnel and L-train were brought back online quickly, but the damage meant repairs would eventually be required. At first glance, Dell’s engagement in this exercise may seem accidental and random. Why is Dell involved in a hackathon focusing on commuters in NYC? Yes, it’s important, but it seems to be a little out of our swim lane. I’d like to share how this work is a natural extension of our Legacy of Good program. By 2020, the good that will come from our technology will be 10x what it takes to create and use it. Footprint? We’re talking about the impact our products and actions have on the world – both socially and environmentally – what is left behind. You may have heard about a carbon footprint, or a water footprint. Generally speaking, we have a good idea how to measure the environmental side of a footprint and we’re learning quite a bit more about the social side. Outcomes, however, are a different story. The effect that our technology can create – the positive social and environmental good that various solutions can produce – that can be harder to understand and measure. But if we’re to truly understand the relationship between our technology and the social and environmental good they can do, we have to be able to measure outcomes. We also must understand the causal links between our technology, our solutions and these outcomes. So, in 2014, we started studying outcomes from the use of our tech. We started with online education. Then, we looked at the connections between our work-from-home programs and our employees’ carbon emissions. We talk more about these studies here. Later, we started a piece of work with Forum for the Future to look for other areas where our technology and sustainability intersect. When transit authorities and operators make data about their systems public, do they create an environment where entrepreneurs and developers can build socially and environmentally positive solutions off their data? As with all our studies, we went in somewhat naïve, but with an open mind and a willingness to dig into a problem. We thought we would find clear, quantitative evidence of value-added solutions driving reductions in carbon emissions. What we found was somewhat different. The anecdotal evidence is substantial, but very little of it is quantitative. In fact, while there’s a lot of data about open data – number of data portals, number of datasets, number of Application Programming Interfaces (APIs), frequency of access – there’s very little data on what happens as a result of making data publicly available. We found a gap. While in the real world, digital transformation and sustainability frequently converge, the data community and sustainability-related communities are mostly separate. Our data analysts and visualization scientists are smart, but spend little direct time on social or environmental issues. Our sustainability professionals are also smart, but the world of data science is a different place with its own language and tools. The result of this gap: open data initiatives are almost certainly under-valued and under-leveraged. They’re under-valued because we can’t concisely communicate the full benefits they provide. They’re under-leveraged because, without a stronger understanding of the links between open data and positive outcomes, we do not know how to best use these tools to drive outcomes. So, our study changed. Originally an exercise in measurement, it became a deep-dive into this gulf between worlds. If we’re to learn how to focus on technology on doing good, we’re going to have to build bridges between these worlds. And, in this case, to build those bridges, we’re using a tunnel. First, we must find the right metrics or indicators that reflect our outcomes of interest, and are measurable or calculatable through available data and data analysis. We think a good place to start are the WBCSD’s Sustainable Mobility Indicators. Second, our public organizations either need to ensure they have access to data analysis and visualization skills, or build those skills in house. In fact, we’re inspired by NYC – their Mayor’s Office of Data Analytics is a case study in how to create and leverage these skills. Last, we need our public organizations and communities to create engagements with the open data ecosystem that provide guidance and direction. There’s ample evidence that the ecosystem wants to help, wants to drive positive change. If we don’t tell them how, though, they’ll be limited in what they can achieve. 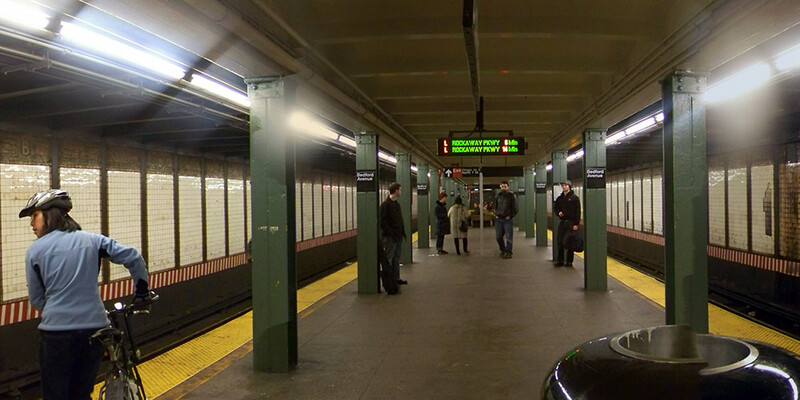 A hackathon: could it be NYC’s ticket to helping alleviate transit challenges? So, how did we get from a year-long effort to study open data to a day-long hackathon in a building located next to Grand Central Station? As we were finishing our study, our friends at Forum were busy engaging with various groups in New York City. The Mayor’s Office of Data Analytics was suitably impressed, and invited Forum to run an event during Open Data Week. Our opportunistic streak came out – not only were we being offered a chance to talk about our work, we could test some of the recommendations in our study, as well as help NYC address some of the issues surrounding the closure of the Canarsie Tunnel. Several people from NYC’s transit community were in attendance. This is, after all, an issue that’s close to their heart. They understand the importance of effecting repairs to the tunnel, but also understand the magnitude of the disruption that will cause. Other than contractors, I suspect there are few who are thrilled with the shutdown. Nevertheless, it’s necessary and must be managed. Seventy people on ten teams listened to our dignitaries from NYC’s transit community describe the issues, and discuss various datasets that were available to the teams. They listened to me and Rodrigo Bautista of Forum describe what we were looking for and provide the larger context for the effort. Then, they went to work. At the end of the day, the teams presented. All the ideas were interesting, but three, in particular showed real promise. It’s our hope that the work started in this session continues, that the teams and groups engaged in the work explore these ideas in more detail. We’re working to drive that, but this will take some time to play out. The shutdown of the tunnel is huge for the affected commuters and communities. The issues leading up to that shutdown, however, are larger still. The flood was unprecedented, but the unprecedented seems to be more and more common these days. While no single weather event can be attributed to an increase in carbon emissions, both sea-level rise and increasing sea-surface temperatures suggest that the magnitude of Sandy’s impacts were amplified by climate change. The MTA prepared for the storm and had most of its subway service restored within a week. Despite the precautions, however, the damage cause by the event was significant. Post-storm estimates were that it would take $4.8 Billion to restore the MTA to its pre-storm condition. When we uncover the connections between our world of technology and the world of outcomes, we make both ourselves and our customers successful. Please excuse the pun, but, to be a trusted partner of our customers, we need to understand the environment in which they work and how what we do can help them meet their goals. In this case, we help our customers be successful by taking a deeper look into the problems they’re facing and the challenges they must tackle. When we uncover the connections between our world of technology and the world of outcomes, we make both ourselves and our customers successful. Our work revolves around 1s and 0s. We convert them into each other. We store some; we delete others. We use our 1s and 0s to build bigger constructs, to represent the world. Then, we analyze our patterns of 1s and 0s to understand the way things are, to learn something new, or to develop insights that help guide decisions. But our world of data, computation and connectivity is not the only world out there. Others focus on impacts and outcomes, the well-being of our society, the health of our ecosystems. In this world, our 1s and 0s may seem intriguing and magical, but possibly also arcane and uninterpretable – raw material without a guidebook or owner’s manual as to how to use. Being a true partner to our customers is more than being just a provider of technology. It means building bridges between our technology, our customers and their needs. And in this case, building a bridge means fixing a tunnel.